With the loss last night, the Brewers more or less became sellers at the trade deadline. We should see Francisco Rodriguez, George Kottaras, Shaun Marcum (if healthy), and even Randy Wolf heading for other teams by July 31. But the big question: Will Zack Greinke be among them? Greinke has a 5-year, $100M+ (reports are that the offer falls somewhere around $110M) offer on the table from the Brewers. That’s no doubt a lot of money to walk away from, but players on the cusp of free agency have frequently turned down such offers before. Prince Fielder and C.C. Sabathia, for example, were both offered similar contracts and opted instead to test free agency, where they earned monster deals. C.C. Sabathia went on to sign a record contract with the Yankees at 7 years and $161M. The deal included an opt-out clause that went unexercised, adding another year and $30M to his deal. Prince Fielder, of course, moved on to the Detroit Tigers this offseason, somehow working them for a 10-year, $214M contract. In case you were wondering, that’s enough dough to buy 107 million Krispy Kreme Donuts. There’s the rub. As it stands right now, the market for Greinke is not going to be similar to that of Sabathia or Fielder. Most had Greinke pegged as a 5-year, $85M+ guy heading into the season, at least until Matt Cain’s astonishing extension this April reshaped the pitching market. Cain received the third-biggest contract for a pitcher at 6-years and $127M, although only 5 years and $112M of that was new money. That certainly upped the ante for Greinke, though. Most now expect him to sign something close to the Brewers’ offer. Some writers think Greinke may be worth a Matt Cain deal, but there is a good chance that some GMs see him as worth less because of his performance history and anxiety issues. I would tend to agree that there is more risk to signing Greinke than there would to signing Matt Cain, but, as Fielder showed, it only takes one owner that thinks differently. “As it stands right now” is a pretty big caveat, though. The wild card is Cole Hamels, who would almost certainly be more coveted than Greinke as a free agent. The Phillies are pushing hard to resign the left-handed ace, and have reportedly offered a 6-year deal in the low $140M range. While that really shouldn’t shock anyone (that’s probably close to what Hamels would pull down in free agency), it doesn’t bode well for the Brewers chances of signing Greinke to an extension. If Hamels signs, Greinke becomes the top free agent pitcher, and that label might very well get him to 6 years and $130M. The ball is really in Greinke’s court, though I doubt he’ll sign an extension. 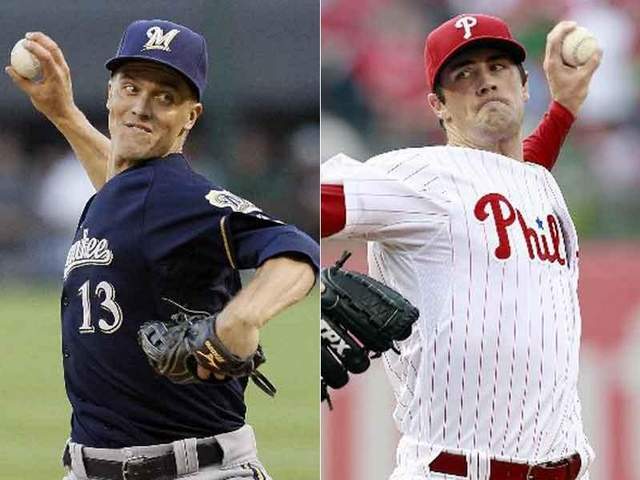 It appears likely that Hamels will sign with the Phillies, meaning Greinke is in a good position to achieve a 6-year deal worth more than $125M on the free agent market, well in excess of what the Brewers are offering. Perhaps the Brewers can get creative and include an opt-out and some vesting options, but even that may not be enough to entice the righty Cy Young winner. And the Brewers still have to think about having enough money to remain competitive in one of baseball’s smallest markets. This entry was posted in News and tagged 2012 payroll, 2012 Trade Deadline, C.C. Sabathia, Cole Hamels, Matt Cain, Milwaukee Brewers, Philadelphia Phillies, Prince Fielder, San Francisco Giants, Zack Greinke. Bookmark the permalink.